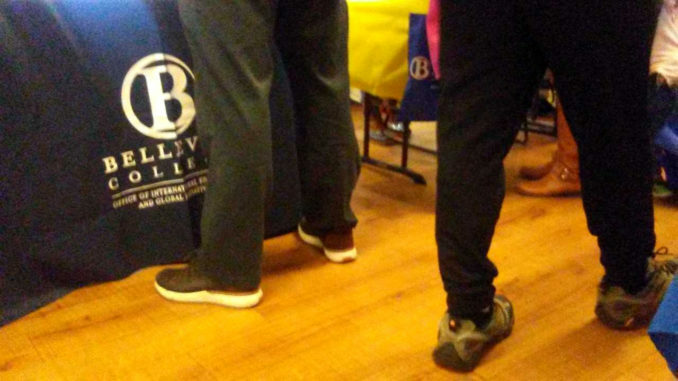 As is tradition, Bellevue College hosted its quarterly welcome fair, Get Involved at BC Day, on Wednesday, Apr. 10 from 11:00 a.m. – 2:00 p.m. in the Student Union building, or C building. The purpose of the fair is to welcome students to a new quarter and to the BC community. The fair is a good resource for people who want to learn more about BC and become a part of this community. At the fair, people could learn more information about some of the resources on campus. Students who participated had the opportunity to meet with club leaders, hear the scoop on exciting events and student job postings, and join a club on the spot. Student Programs, which sponsored the event, provided light snacks and candy to welcome each of Bellevue College’s students and staff members. The area around the cafeteria started getting busy around 11 a.m. when different clubs, programs and off-campus organizations set up their tables. Representatives at each of the tables were eager to promote themselves to students, and encourage them to get involved with their club or program. One of the program representatives, Erika Lamothe, Outreach Coordinator from the Office of Sustainability, said, “I am tabling for the Office of Sustainability to promote Earth Week and our Earth Week art gallery.” Earth Week is coming up on Apr. 22, and Lamothe is looking for students’ artwork based around sustainability. “I think students are gaining a lot of exposure to local opportunities and BC community, which is a really good experience for new-comers.” added Lamothe.